after sitting a very long time on my needles untouched, I finally picked up my sock to be and finished it off. It is my first sock, and I think I would like to make its mate after I finish off a couple more of my WIPs. It's made of some self stripey soft TLC on size 7 circs from the Weekend Knitting pattern on striped jazz socks. I think I'd like to get better at the kitchener stitch as the end of the toe and heel looked a little funky. I'm also heading off to a baby dinner thing tomorrow, so I've made a quick umbilical cord hat from some bernat cotton tots. So cute! 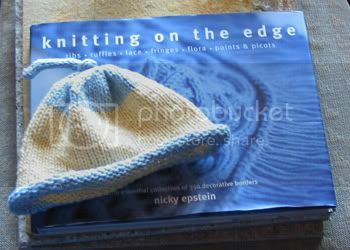 I posed it with my new book, Knitting on the Edge, which I have been coveting for quite awhile, but I only bought it recently when my friend Lourdes brought me a 40% off coupon for my local Michael's! 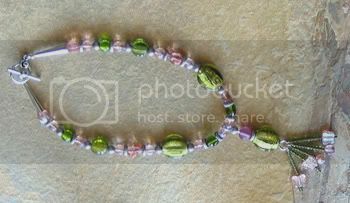 Speaking of Michael's, I couldn't help but pick up a few beads to make this pretty choker for my mom's bday (in september, I'm just preparing early). 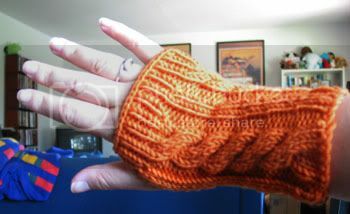 I also finished off Roxy's bday gift of orange irish hiking arm warmers done in that wonderful Anni Blatt yarn I bought in Texas. If you're ever in SF on the weekend, I highly recommend looking up the Blue Jay Cafe. Their brunch is FANTASTIC and quite reasonable. Evvie ordered a pulled pork sandwich which was delish! And I got some sort of yummy andoiulle sausage scramble. The place is a small popular neighborhood spot that serves up some yummy southern type cuisine! 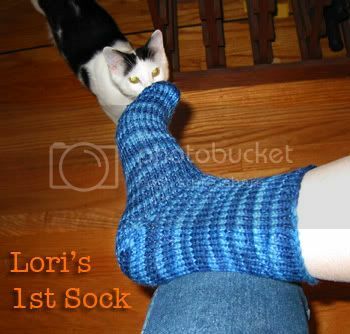 Your first sock looks amazing! I'm on my fourth pair and I'm still trying to get it just right. That jewelry for your mom is beautiful, what talent! I like that arm warmer! Where did you get the pattern?